The name Six Degrees derives from the “six degrees of separation” theory that everyone is six or fewer steps away from any other person in the world. 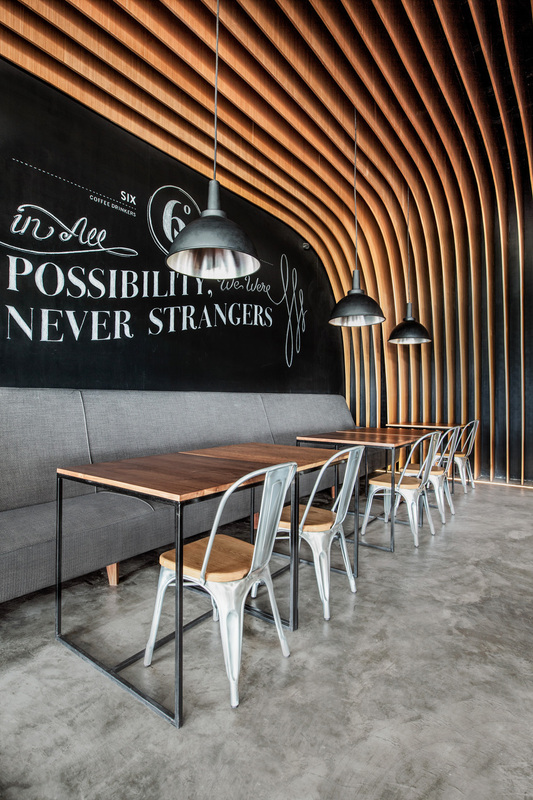 The owner envisaged the cafe as the meeting place for friends socialising over a cup of coffee. 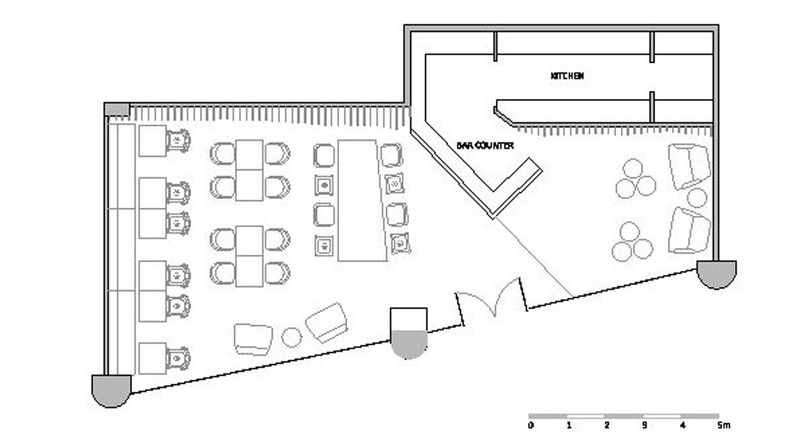 The design brief was simple: to make the cafe memorable, comfortable and distinctive. 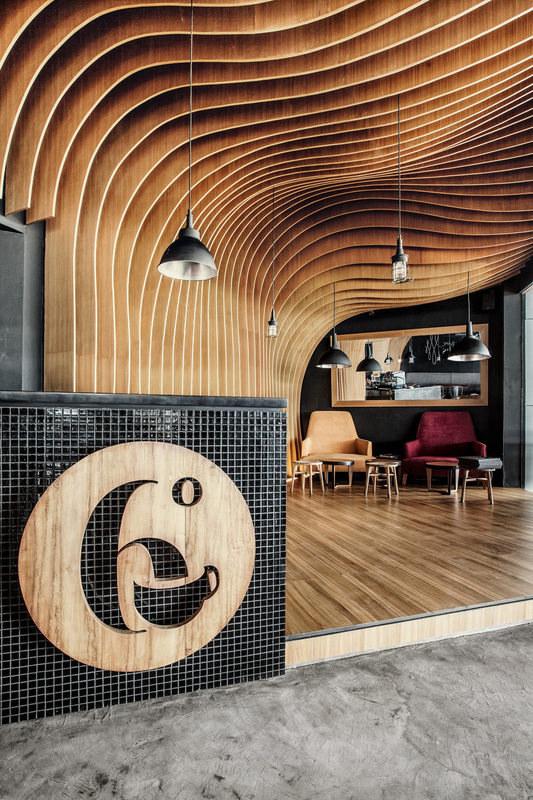 Located in Jakarta, 6 Degrees Cafe has a rectangular floor plan with a 16m shopfront. 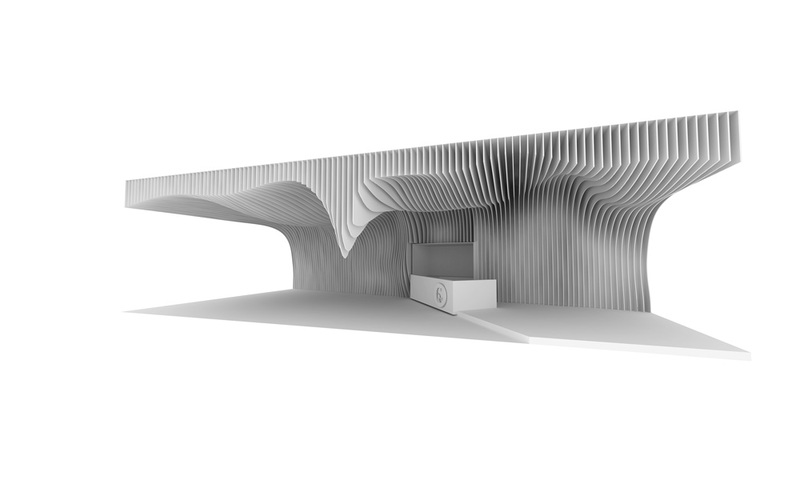 OOZN’s design response uses undulating timber panels which flow along the rear wall and ceiling in a singular powerful gesture meeting all of the brief requirements with a simple architectural device. 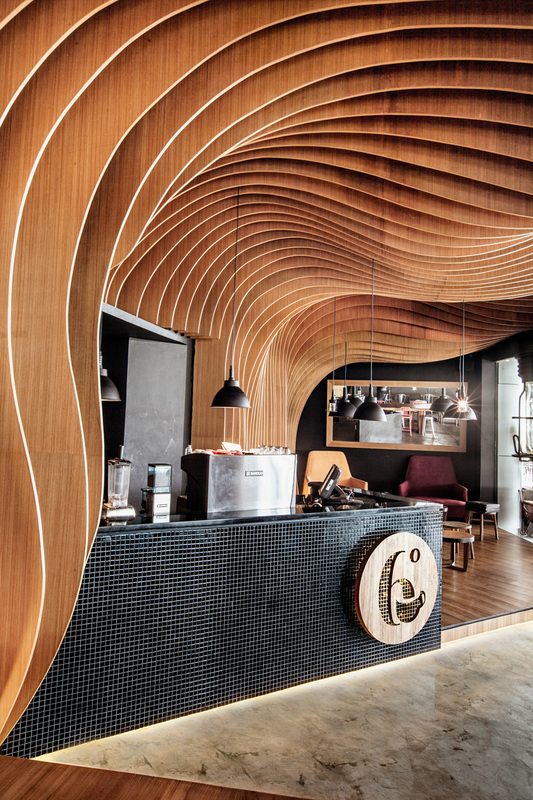 The flowing panels create a distinctive design identity whilst creating a warm personal interior. Situated inside a mall in Jakarta, 6 Degrees Cafe has a rectangular floor plan with a 16m long shopfront on the long side. The most visually impactful from the exterior was the ceiling and the rear wall, so we focused on it. We created an undulating skin of timber slats equally spaced apart at 150mm intervals which covers the entire wall and ceiling to break the monotony of spatial heights. 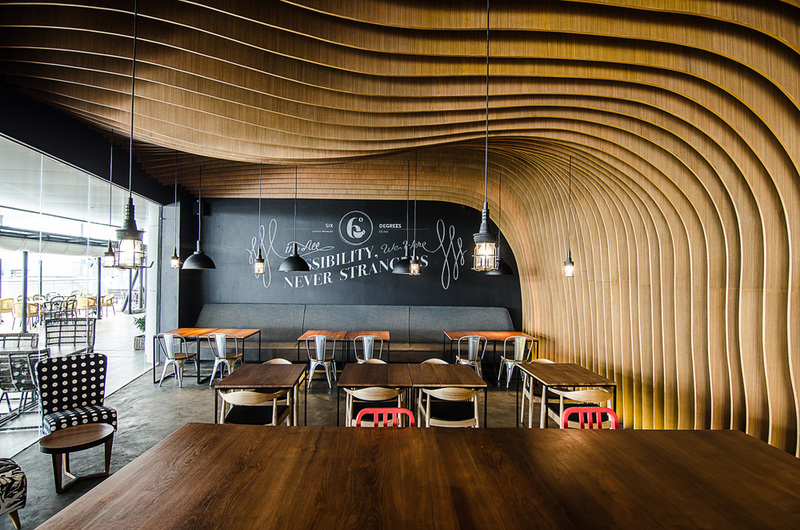 Undulation of the veneer plywood were hand crafted by the local carpenters, meticulously following the unwrapped elevations drawn by us. 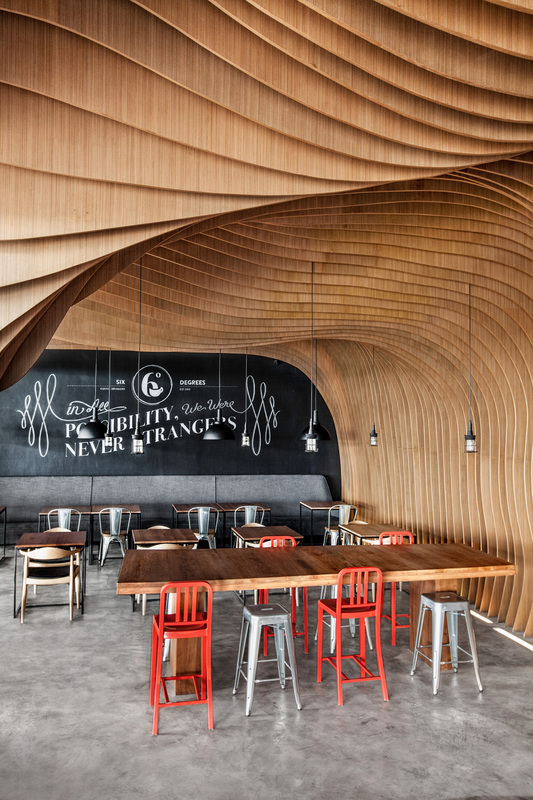 Varying depth of the fins not only create a strong visual impact, they also hide the ceiling equipment and improve the acoustics inside the cafe. With music in the background and heavy flow of customers, individuals are still able to enjoy a chitchat over a nice cup of coffee. 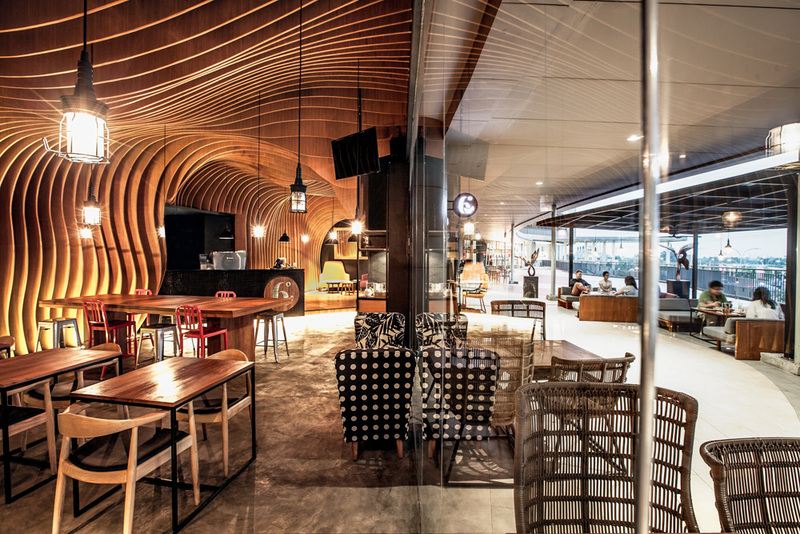 The interior comprises four types of seating areas so the customer can choose the environment best suits their mood. 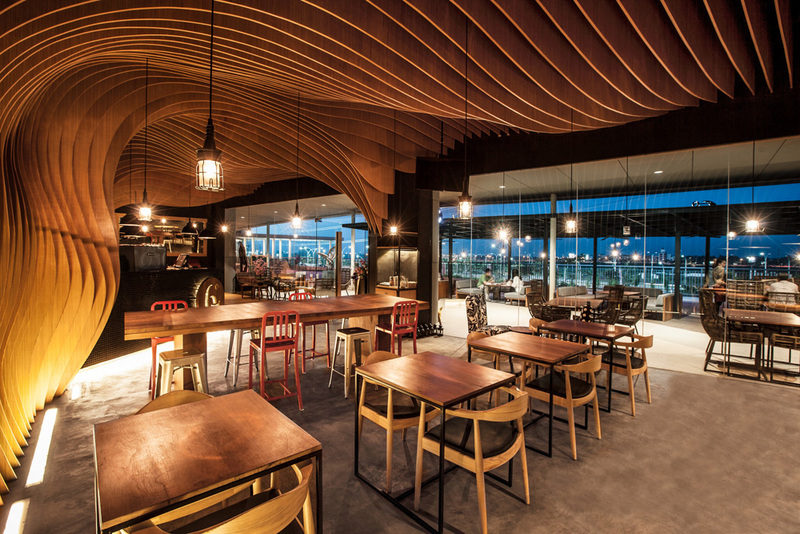 A group of people who comes here to socialise can hang around the huge bar table; a person who needs a place to read a book or a couple who just want to have a quiet dinner can find their favourite spots. Finishes were carefully chosen to create a cosy and relaxed ambience using natural materials & colours, including the selection of the furniture. Timber veneer slats matches the concrete screed floor to give a rustic touch. Warm timber and natural tones contrast with a dark interior paint provides an escape from the outside heat. Individual pendant lights hang over each table, floor recessed strip lights gives a soft illumination to the timber slats, providing just the right amount of lux level to create a soothing ambience. With evident amount of returning customers, we believe we have achieved the goal of making the cafe a memorable and cosy place for socialising over a nice cup of coffee.